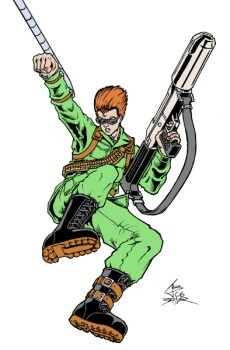 I've done pics of Bionic Commando's hero before and the versions from 2004 and 1999 are here on the site. As an all-time fave game character, I just had to keep drawing him until I got a decent result. I had the original pose sketched in early 2005, but I just had the urge to draw it after getting Capcom Classics Collection (including the arcade Bionic Commando). With a lot of other things going on this week, I almost didn't get this 5th pic of the year done before the midnight deadline for this week. The look is based on the "Stage Complete" graphic (seen below) with bits and pieces from official Capcom artwork. Wish I could've done more with the rifle, but I think I finally got the hair and face right. Update (Dec. 17 2006): the parts where I was fighting the eraser burn and white-out are bugging me too much to even continue with coloring this one. As much as I don't want to spend a ton of time on fan art next year, I'm going to redraw this pose with (hopefully) smoother linework. I'm still posting the flat color version to motivate me until I get the new one done.